Lin-Manuel Miranda has been working tirelessly to do everything in his power to come to the aid of those in Puerto Rico who lost everything after Hurricane Maria ripped through the island last month. The composer and playwright, who is mostly of Puerto Rican descent and has family on the island, recently recruited over a dozen artists to record a one-of-a-kind benefit song, with proceeds going to the Hispanic Federation's Hurricane Relief Fund. 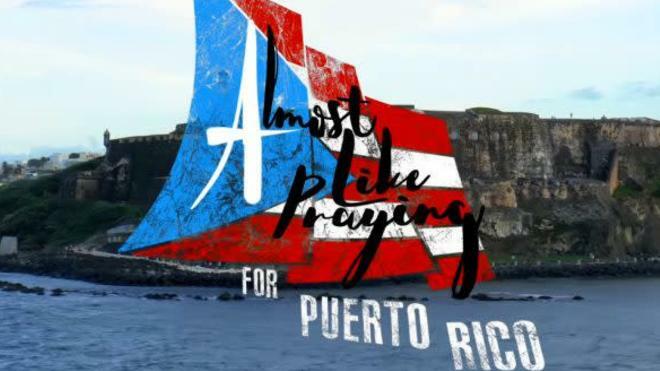 The song, "Almost Like Praying," helps give a voice to Puerto Rico amid the recent devastation (and highly criticized response from the U.S. government). An all-star cast of collaborators lent their talents to the good (and crucial cause), with the likes of Jennifer Lopez, Fat Joe, Joell Ortiz, Marc Anthony, Ruben Blades, Luis Fonsi and more, all featured on the benefit song. Check out the song below and for more information on how to get involved with hurricane relief for Puerto Rico and the U.S. Virgin Islands, please visit here. In record time, an Almost Like Praying music video.